While we’re on the topic of character songs, and interesting tidbits behind thing, I thought I’d share with you the fact that of all the Sailor Soldiers – and, indeed, many of the main cast! – only Hotaru and Setsuna went the entire series without having their own character songs. This is purportedly because their voice actresses couldn’t sing. I can’t say whether or not this is the case, but it’d be a good explanation! What’s more, she had already performed a song as Haruka back during Sailor Moon S for her character song 風になりたい (Kaze ni Naritai; I want to be the wind). Stranger still, not only did Megumi Ogata not perform the song, but someone else actually did, which is something you don’t see with the other characters. So, what gives? Well, as usual, the internet has an answer. Keep in mind that I can’t find any hard sources such as magazine interviews or quotes on websites, but the information I found across various blogs and websites all seem to support the same story. Initially,2 Initial U was planned to be released together with Sailor Neptune’s character song, 戦士の想い (Senshi no Omoi; Soldiers’ Love), but it was first delayed and then cancelled outright. The song finally made its debut not as a a single (like all of the other character songs), but in the Pretty Soldier Sailor Moon Memorial Song Box. The reason for this is apparently because Ms. Takeuchi was signed on to write the lyrics for all of the Sailor Moon Sailor Stars character songs, and Megumi – who takes her roles very seriously – didn’t really appreciate the take on Haruka’s character. Read also: What Gun Did ChibiUsa Use to Threaten Usagi? To be fair, this argument isn’t totally without merit. After the series had gone on for five years at this point, it’s little wonder that the characterizations as Ms. Takeuchi saw them would differ from how they had grown and developed in the anime. What was wrong with it? Apparently, in one her not-uncommon open-heart, tell-all discussions on her late-night radio program 緒方恵美の銀河にほえろ! (Megumi Ogata’s Calls Out to the Galaxy! ),3 Megumi stated that the lyrics didn’t reflect the anime Haruka that she helped create, and she wanted to protect that version of the character. Considering the single got delayed and then ultimately cancelled, I’m guessing that Ms. Takeuchi also refused to rewrite the lyrics into something more suitable, so that would have put them at a bit of an impasse. 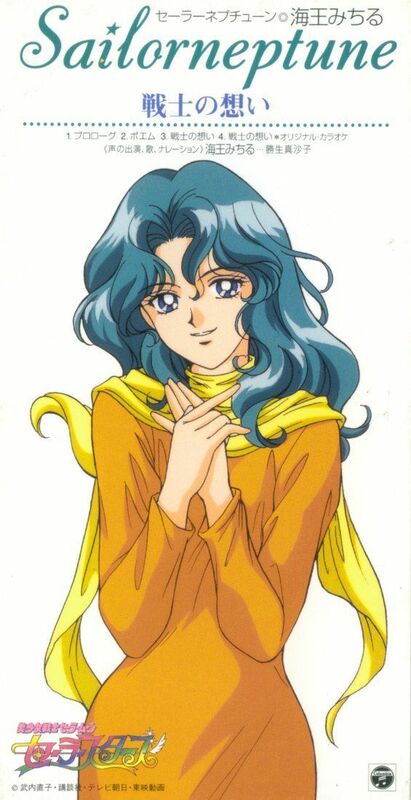 After all, while Ms. Takeuchi refused to go against how she viewed her characters, Megumi – as a professional voice artist – probably couldn’t fathom using Haruka’s voice to say things Haruka would never say. Noble choices for both of them. Tangentially related, but I’ve read a lot of stories about how stubborn Ms. Takeuchi can be – some even describing her as “difficult to work with.” That’s something I’ll have to explore another day. Now, what was wrong with Initial U as a song? While I can’t say for sure, everything I’ve been able to find says that she felt the lyrics were too superficial – they lacked that strength and determination that Megumi felt Haruka was known for. Oh, and also, the song’s title is a cheap play off of the car-racing manga Initial D 4 and it’s filled with not-so-subtle car and racing references. I mean, checker flags, Ferrari? No offense, but it reads like an Initial D fanfic more than it sounds like a poem recited by Haruka. At least in my opinion. Perhaps the most interesting turn to this story is that Megumi ultimately released her own tribute song to Haruka on her album “M.O.” in the form of the song 風になる (Kaze ni Naru; Becoming the Wind). Even more interesting about this song is that it’s essentially identical musically to Initial U, but with all new lyrics. Have a listen! I wish there was more solid proof to offer here, but unfortunately this is all speculation floating around on the internet. It’s clear that something did happen, though, when you consider the fact that the song was delayed and ultimately cancelled before being revived later with a different person hired on to sing it. Then add in the fact that Megumi did her own rendition of the song later, and it seems pretty obvious something was up. If this is all true, what do you think of her stand on the issue? Does the voice actress also have some say in who their character has become? Or is it selfish to tell the creator that they don’t know what the right characterization is? Personally, my take on the situation is that Megumi made the right call. Not necessarily because she would be betraying Haruka, but I think the whole concept was flawed. The idea of selling the manga characterizations with anime art and the anime voice actresses comes off as… wrong to me, because these are clearly two different universes. But that’s just me. ← Is Sailor Saturn a Member of the Outer Senshi? Pretty interesting; This was a controversy I was intrigued since ever… In my opinion we are talking about strong personalities colliding, Princess Naoko its known for being difficult and Megumi Ogata is a legend by herself… so there must me some truth behind all these bogus stories of what happened at that time… even more if Naoko was writing the songs (I didn’t knew that, thanks) even if she is not the best creating deep back stories for her characters she’s the “owner”. I think it was just weird for Ms. Ogata to act like that. After all, it’s still money and she was still a employee. I would never have refused in her place. Naoko is to blame for a lot of damage done to SM after her licensing company took full control over SM rights, but in this case is more of an actress’ ego. Oh, and Risa Ohki’s (Initial U singer) main career is actually singing, and she has games and Japanese dubbing of songs featured on Western shows in her portfolio. Not dissing Ms. Ogata, but I guess this happened for the best. I wish a professional singer had been hired for Usagi’s image songs, Kotono was never really good at that. I’ll be totally honest – I would’ve been okay if they had done professional singers for many of the image songs. Not to say that they were awful, but these voice actors and actresses don’t specialize in singing and don’t have the depth that a lot of the songs deserve. Oh, yes, especially for Araki Kae. I cringe every time I hear her singing a Chibiusa or Miaka song. I can definitely see both sides here. Megumi was hired for a job, and she didn’t do that job. As a professional, you should never let that happen. Her taking credit for Haruka’s anime portrayal is also a bit unfair to the writers and directors who also helped form anime Haruka. On the other hand, it’s Megumi Ogata’s name on that cd, and especially in music, it’s 100% her being portrayed here. The only thing Sailor Moon-related is the lyrics (and only barely, in this case). So I can definitely see her objecting to putting her name and voice on a work she doesn’t believe in. There was a really nice write-up by a fan who described how she was really angry when she was a kid because she really wanted to hear Sailor Uranus’ image song. But as she got older, she came to realize that this was a really odd way to go about it, and even somewhat deceptive to fans. It was packaged as an anime product, it was sung by the anime cast, but it was a story told from the manga point of view. Not that there’s anything wrong with it, but if they were going to sell a manga product, it should’ve been branded that way. And possibly used different voices. Just an interesting way of looking at it! I’m on actress side, maybe because I don’t like mixing anime and manga canons too much and I agree that characterization varies quite a lot. I don’t like she described herself as the one who “created” anime Haruka, writers, animators, directors are probably more important than her in this case. Maybe it’s just a poor choose of words from Megumi Ogata. Unfortunately it’s all third-hand information reported by fans about 20 years later, so we’ll never really know what she really said about it, but ultimately I think I’d have to agree with her decision to not do it. Even if Naoko is the one writing the lyrics, Megumi is the voice on the CD and the one everyone will associate with the words. If she feels that she’s portraying the character “wrong,” I think she should have some say in that. No need to apologize! I’m always just happy to find out that there are people who are actually interested in reading this blog. It’s also a lot of fun to be able to read comments from those who read it, since it can give new insight that I never really considered when writing the articles. Sometimes, the comments inspire new articles — so it comes around full circle! I have heard stories regarding actors getting attached to their characters, and believing that they can second guess them better then anyone else, including their creators. Most recently Mark Hamill has spoken about disagreements involving Luke’s portrayal in The Last Jedi for example. Saying that, I am curious to what exactly Megumi had issues with. 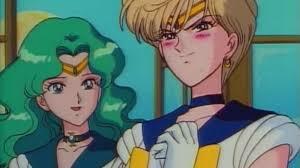 I know the Anime put a lot more emphasis on Haruka’s relationship with Michiru, and had her dress more masculine. But outside of that I’m struggling to think of any drastic differences. Though I am grateful for them taking out ‘that kiss’. But I don’t think we are really in any position to take sides in this matter, since we don’t know the full story. It could be ego. It could be that Naoko wasn’t on friendly terms with her, like she was with the Inner’s voice actresses. Or it could simply be something trivial that’s got blown entirely out of proportion, and paints them both in an unfair light. Ultimately, I say it’s probably best to keep the two universes separate. It’s like using the Manga bio for Rei when referring to the Anime, and vice versa. It can lead to unnecessary confusion. 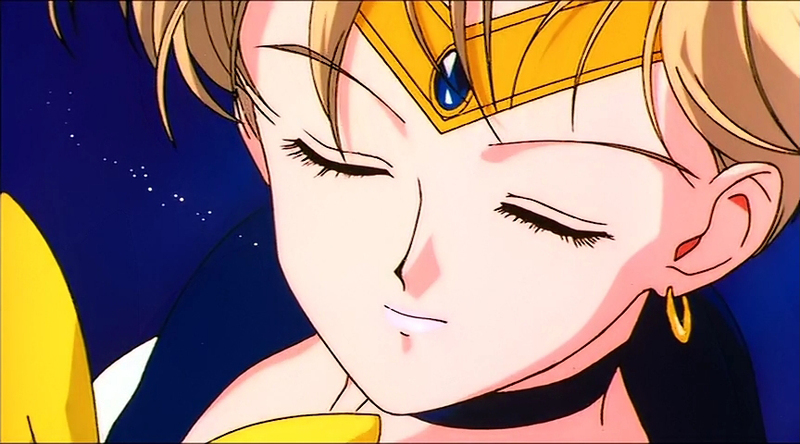 And in all fairness, both Sailor Moon’s conception and execution can’t solely be attributed to just one person. Naoko’s editor, the Anime staff, even the voice artists themselves all played their part in adding elements. But I thought the cast did a respectable job, especially since they (Kotono in particular) had to do it while in character. Aya and Michie shone the most for me. I think it is just confusing what her issue with the song was. I looked at the translation of the song in English and it just isn’t that specific so I don’t know if she just found the song had bad lyrics because it does not seem to speak on anything that would give away her character at least to me. I think the voice actor always can have a choice and voice their own opinion. After all everyone is entitled to their opinion. However, if it is contractually obligated than that is something else. Honestly, I don’t think either the anime or the manga did the really give enough back story about any of the outers. To me there is no right characterization. Everyone’s interpretation is different. That’s a really good way to look at it, especially when you consider how little information we were given about these characters to begin with! Might be important to note Ogata was also one of the ‘younger’ actresses careerwise among all the senshi – IIRC, she started around 1995? – so I could see her resistance being seen as inappropriate to her station. I don’t think Takeuchi ever officially commented on the anime version of Haruka beyond a half(? )-joke about how the Outers seemed more aggressive in their introduction. The musicals at least, seem to have always leaned into Naoko’s own interpretation of the character, visual setpieces aside, so I’m not surprised if she did lean into her own version more.